Special sizes and capacities upon estimate. Low profile electronic platforms with removable chequered loading plate. Fitted with IP68 STAINLESS STEEL load cells. Suitable for creating scales and electronic weighing systems for all types of industrial and commercial applications. Standard version is with approved load cell. ETIP68 IP68 connection fitted with specific cable, fairleads and connectors. IP69KLC IP69K version for one loadcell. ETAPI Stainless steel loading surface 1000x1000x4 mm, for ETA platform. ETMPI Stainless steel loading surface 1000x1250x4 mm, for ETM platforms. ETBPI Stainless steel loading surface 1250x1250x4 mm, for ETB platform. ETDPI Stainless steel loading surface 1250x1500x4 mm, for ETD platforms. ETEPI Stainless steel loading surface 1500x1500x4 mm, for ETE platforms. ETFPI Stainless steel loading surface 1500x2000x5 mm, for ETF, ETG platforms. ETHPI Stainless steel loading surface 1500x2500x5 mm, for ETH platforms. ETATF Frame for flush floor installation for ETA platforms. ETMTF Frame for flush floor installation for ETM platforms. ETBTF Frame for flush floor installation for ETB platforms. ETDTF Frame for flush floor installation for ETD platforms. ETETF Frame for flush floor installation for ETE platforms. ETFTF Frame for flush floor installation for ETF platforms. ETGTF Frame for flush floor installation for ETG platforms. 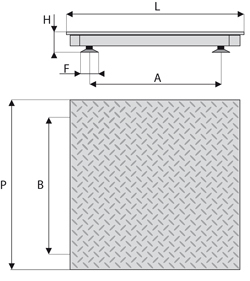 ETHTF Frame for flush floor installation for ETH platforms. ETLTF Frame for flush floor installation for 2000x2500 mm platforms. ETAR Painted steel ramp, 1000x900mm, for ETA and ETM platforms. ETBR Painted steel ramp, 1250x900mm, for ETB platforms. ETDR Painted steel ramp, 1250x1100mm, for ETD platforms. ETER Painted steel ramp, 1500x1100mm, for ETE platforms. ALSO PROTECT THE PLATFORM SIDES BY MOUNTING, WHERE NECESSARY, APPROPRIATE ANGULAR PROTECTION PIECES (GUARD RAILS).